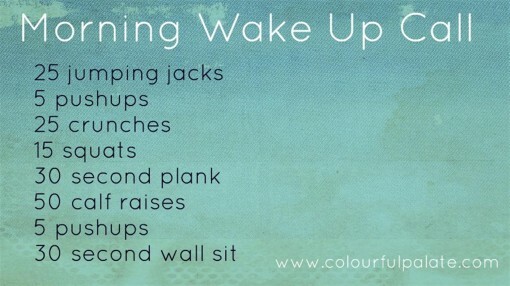 Wake Up Call Workout was posted on June 19th, 2012 and is filed under Fitness, Workouts. This entry has 10 comments. You can follow any responses through the RSS 2.0 Comment Feed. I put up my workout/fitness posts on Monday (or Motivational Monday as I call them), but we’ve been having such a wonderful time with my sister and her kids that I didn’t want to sacrifice any family time to get a post put together. I find that I’m super slow in the morning. I am just NOT a morning person…I just sort of wander around the house getting stuff done. It’s probably the only time of day where I’m completely silent. If anyone needs a wakeup call…it’s me.I find that working out in the mornings is really hard…but for me, almost necessary. Even if I just do a 5-10 minute workout it gets me going and wakes me up. I also really love squats – they are such a great lower body workout and you can do them anywhere. Sometimes I’ll even do them while I’m brushing my teeth! It gets your lymph system going and puts a smile on your face. Seriously. It’s such fun. …And no, my head didn’t hit the ceiling, but it was close. Well, we’re off to take my sister and her kids to the airport…it’s so hard to say goodbye! great workout! love the last picture, too fun! Sounds like a great,quick workout! I’ll have to try it! I am not a morning person either, but that is the best time for me to work out. The later it gets, the less motivated I am to work out. I actually am a morning person. I do my workout first thing in the morning. It helps keep me going the rest of my day. Love this! Can’t wait to give this workout a try tomorrow AM! oh this looks like a great routine, and I so want to rebound!